We constantly monitor our pregnancy rates to assess our success. These are the results of years of experience and continuously pushing the leading edge of education and research in the field of Human reproduction. Again this year, we are well ahead of the average rates for Canadian centers. The most critical factor that determines the success of a cycle is female age and the quality of embryos being transferred. Our current pregnancy rates for 2013 are listed in the table below by female age. The first row of this table is an average of the most recent data from all 26 Canadian IVF clinics (Canadian Assisted Reproductive Technology Register – CARTR) in Canada. We are also happy to report that we have had some excellent success with the use of elective single embryo transfer (eSET). This procedure allows for the selection of one high quality embryo for transfer, providing outstanding pregnancy rates, while virtually eliminating the risks to mother and child associated with multiple pregnancies. 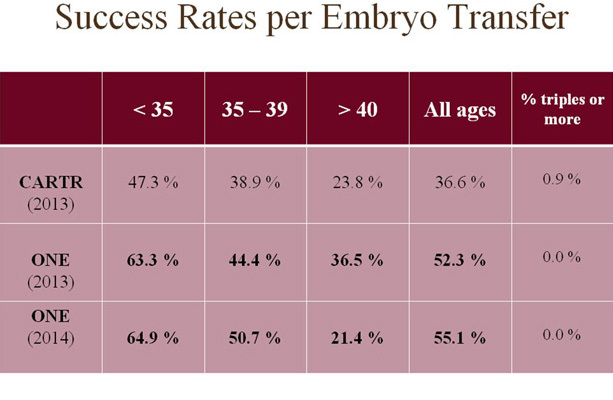 Our eSET pregnancy rate for women under the age of 38 is currently 73.7% per transfer.